Our general statement made yesterday, the day of the German Federal Election, is still valid: nothing will change – the German political system makes real change almost impossible. We forecast that the CDU/CSU/SPD coalition would continue as before, being 'the worst that could ever happen'. Before rushing to judgement on the quality of that guess we must wait for Brünnhilde to finish her tedious bit. Avoiding the shouts and screams of the hyperbole-hungry media, here is what happened on Sunday (numbers correct at the time of writing). The Union– the CDU and CSU (= Bavarians) – got 33.0% of the vote (down 8.5%). They have gone from being a minority party to being a slightly more minority party. They are still the largest party by a wide margin and will thus continue to dominate the future government. By the way: labelling them as 'right-wing' is misleading - they haven't been that for at least fifty years and then some. The SPD, traditionally the party of the organized labour, got 20.5% of the vote (down 5.2%). The media catchphrase 'worst result in the party's history' is true, but misleading. They lost fewer votes as a percentage than the Union did; they also have much more competition these days on their ideological turf from the smaller left-wing parties – the Grüne and Die Linke. After the first results became known, Martin Schulz, the leader of the SPD, stated that his party will withdraw from the 'Great Coalition' that ruled in the last government. Well, let's wait and see. (Readers with long memories will remember Silvio Berlusconi's characterisation of the very unphotogenic Schulz during his time in the EU Parliament as a 'concentration camp guard'). The FDP, traditionally the party of business and finance, has had a bad time in recent years. After the glory days in the 20th-century, when, as power broker between the Union and the SPD, it punched well above its weight, known through major figures such as Hans-Dietrich Genscher. It was always held to bring fiscal probity to a coalition. After the introduction of the Euro, however, fiscal probity seemed a bit old-fashioned in the new world of EU book-cooking. But now, the party has achieved a vote of 10.7% (up 5.9%), meaning that it is back with a bang into the power mix. The party of the permanently disaffected with a nostalgia for the good old DDR, Die Linke, got 9.2% (up 0.6%, i.e. no change). Its fundamentalist, East German world-view is so different to that of any practicable form of administration that a participation in any workable coalition can be ruled out. The Grüne got 8.9% of the vote (up 0.5%, i.e. no change). Having been excluded from power by the Great Coalition they are thought to see their chance for some power-broking in the new constellation. 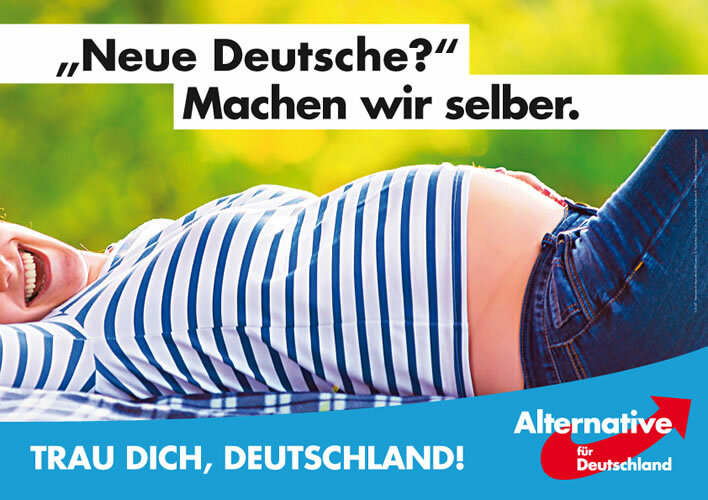 Finally, the AfD, the Alternative für Deutschland. In German terms they did very well: at the last election they did not even succeed in jumping the 5% hurdle for membership of the Parliament. This time they got 12.6% of the vote (up 7.9%), the largest vote share of any of the smaller parties (i.e. apart from the big two, the Union and SPD). They did that despite some turmoil in the leadership of the party. They do not deserve the labels that their political opponents and the unsympathetic media and the copy-and-paste foreign media have slapped on them. Wanting to control immigration does not make you a Nazi, or even 'far-right'. Nor does a recognition of the miserable lot of the common German soldier in WWII, a wound that has never healed, make you a Nazi. Careless talk of a 'far-right' landslide is just bunkum. So, as the leading party, the Union is now required to form a coalition. All the other parties have ruled out forming any coalition with the AfD. The right-wing sea-change coalition that really would give the German electoral pyramid a good tipping, the Union/FDP/AfD, will therefore never happen. Our statement holds: in German politics nothing really changes. Only two realistic possibilities remain. One is a return to the Great Coalition of the two major parties CDU/CSU and SPD, as before. Let's see how long the SPD's rejection of that will hold as they feel the strings of power slipping out of their hands. If they change their minds and enter a coalition with the Union then our statement that nothing will change is indubitably true. The other is the so-called 'Jamaica coalition': black (Union), yellow (FDP) and Green. The existence of such a coalition, protected by a fixed term of four years is a difficult thing for the rational mind to grasp. 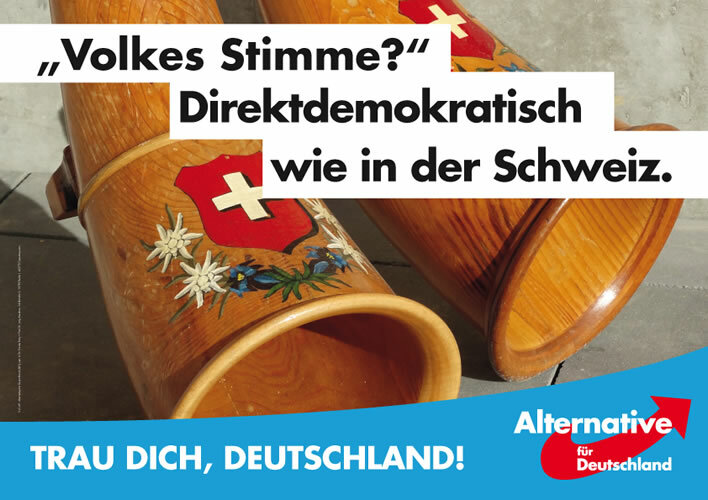 All three parties are bitter political opponents, especially the Greens and the FDP. But that magic pixie-dust, the prospect of power, heals all wounds and drips glue on all divisions. And, of course, the need to regulate and cope with all differences of policy between the three means that our statement that nothing will change is also indubitably true. 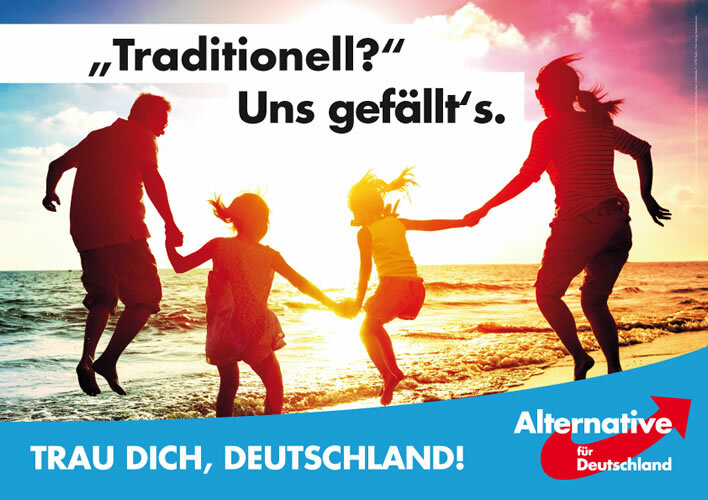 For those who did not experience at first hand the AfD's election campaign, here are some of their disgusting, far-right ideas. If you haven't had your fill of this terrible stuff you should take a look at their manifesto in English (PDF download). Shocking! Remember: 12.6% of the German electorate voted for these thugs! Last Monday, the morning after the AfD's astonishing election success, when no one in the media or on the streets was talking about the winner (Union) or the runner up (SPD), but were all chattering about the AfD, the Co-Chairman of the AfD, Frauke Petry, for many the face of the party, announced without any warning to her other colleagues in front of the cameras at the victory press conference that she would sit in parliament but not be part of the AfD voting bloc (in UK terms: 'not take the AfD whip'). She refused to take any questions, stood up and whizzed out of the room. 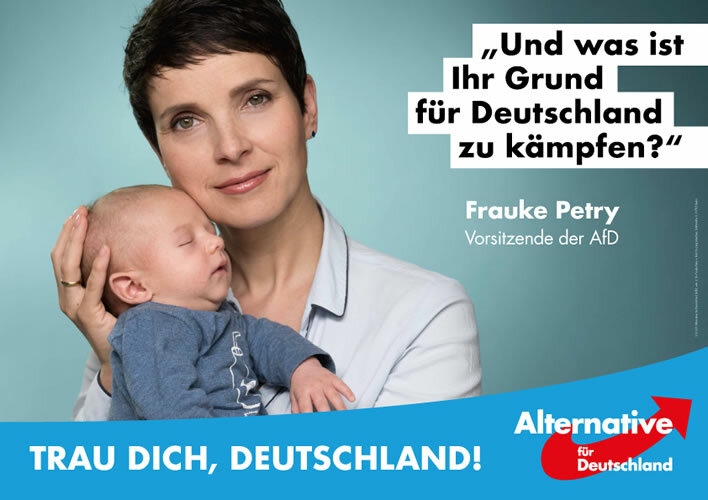 The AfD election poster 2017 featuring Frauke Petry: 'And what's your reason for fighting for Germany? Trust yourself, Germany!' It takes great political skill to stare at a camera with such brazen sincerity. In the election she received a 'direct mandate', that is, she was elected as an individual and was not just as a member of a list of candidates. She therefore became an MP in the Federal Parliament and also in the Parliament of Saxony, where she was chairman of the AfD MPs there. On Tuesday she then announced that she was leaving the AfD altogether, would sit in the Federal Parliament and the Saxony Parliament as an independent MP and she renounced her chairmanship in the latter. 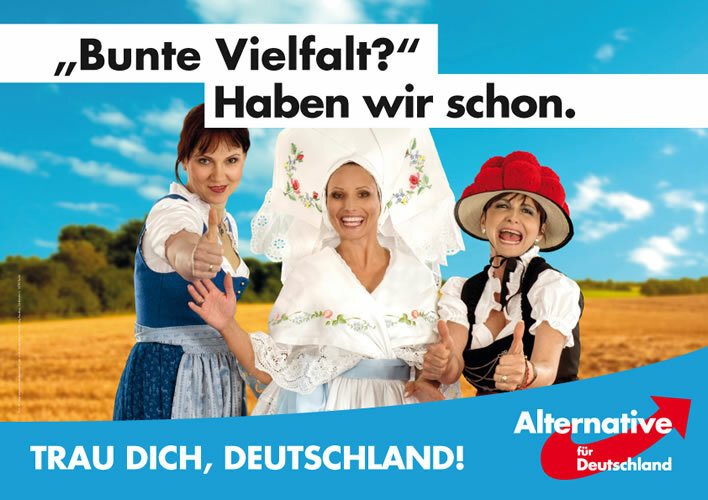 Her husband, Marcus Pretzell, another AfD high-flyer, also left the party on Tuesday, too. 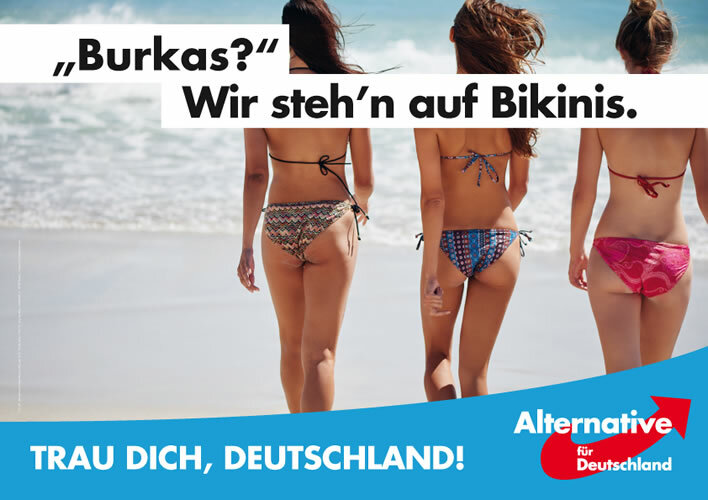 A message of contempt for all the AfD supporters who voted for the pair and the bag-carriers and poster-stickers who got them elected. Yet another confirmation of our maxim: At the election each vote counts. After the election it counts for nothing. Petry's behaviour was not well received by the grassroots members of the party either. 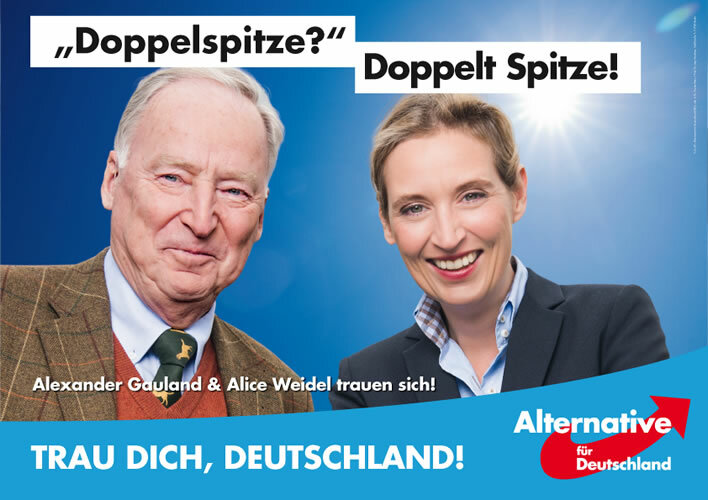 Many voters see it as a deception that, despite all the power struggles, she used the AfD as a vehicle for mobilising voters, in order to then carry on immediately afterwards in her own interest. For all those who have accused Petry for months that she was only concerned with her own personal success her behaviour now is the best confirmation. Many find it particularly offensive that she is not only keeping her seat in the Federal Parliament but also her seat in the Parliament of Saxony. A similar situation applies to her husband, Marcus Pretzell, who despite also leaving the AfD is keeping his seat in Saxony and his seat in the European Parliament. The parliamentary salaries are merged, but not the expenses. The irony is that when the co-founder of the AfD left the party in the summer of 2015, Petry criticised him strongly for not giving back his seat to the AfD. After the 'disaster' of the SPD's performance in the federal elections (5% loss) comes news of the SPD's 'triumph' in the election to the provincial parliament (Landtag) in Niedersachsen: a gain of nearly… wait for it… 5% over the previous election four years ago, their best result in 20 years in the state. The memory of the SPD's three previous disasters in provincial elections this year – in Saarland, Schleswig-Holstein and Nordrhein-Westfalen – has now been erased. The position of the SPD's leader, Martin Schulz, is now secure, meaning that we can once more confirm our general law of German politics: nothing will change. All reports coming out of Germany suggest that the partners in the proposed 'Jamaica' coalition – CDU/CSU-FDP-Green – are finding the lure of power so irresistible that all their deep differences are being forgotten – as we predicted. This means that the next German government will have a bit of right, a bit of sort-of right, a bit of middle-right-left and a bit of green-left, but not too much of any one thing in particular. The resulting colour, once the mixture has been stirred thoroughly, will be exactly the same as the previous coalition. Conclusion: nothing will change. All the knuckle-dragging Ossies (the former DDR lot) who voted for the AfD are beginning to realise that, since no one needs or wants them for a coalition, their hold on power is at best minimal: nothing will change.